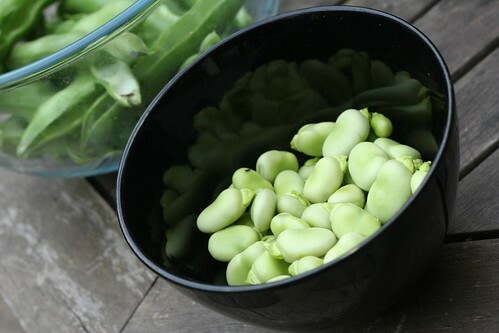 I was always shocked at the price of broad beans until I tried growing them. They are actually quite easy to grow but you really need a whole lot of space to grow enough for even one dinner. Its a pity really as they are so fantastic and even more so when you can pick them and eat them straight away. 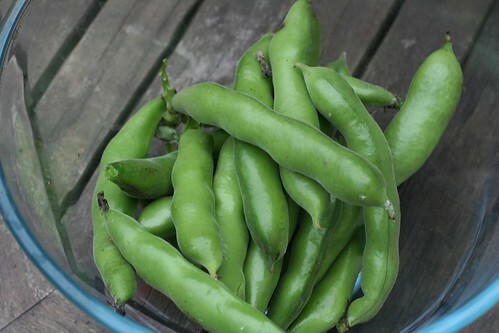 Id definitely recommend trying to grow broad beans if you have some space in your garden. I planted them a little too early but they still seemed to survive the frost and pop through, weeks after I was expecting them to come up. If I had been able to give up enough of my garden I would have made a big bowl of Habas con Jamon (beans with bacon) as I used to get in tapas bars when in Granada last year but its surprising how much space is needed to grow broad beans. 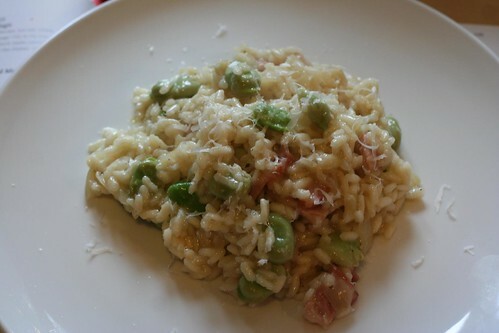 Broad bean and bacon risotto was the next best option. If you haven't made risotto before its really not as scary as people say, just make sure you have enough stock simmering and that you don't let the rice go dry while cooking. 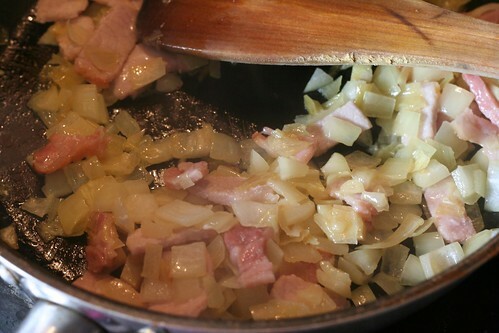 Heat the butter on a medium heat and add the onions and chopped bacon and fry until soft but not yet coloured, something like the picture below. Add the rice and stir for about a minute until the rice is starting to go slightly clear at the edges. Throw in the glass of wine and let it bubble away until the wine is almost soaked up. Then add your first ladle of stock. Again, stir a little and let it bubble until almost evaporated. Continue to do this until the rice has softened enough and stopped drinking up the stock as quickly. This should take about 20 minutes and the rice should still have a bit of a bite to it. Add the beans before you add the last of the stock to heat them through. Take the rice off the heat and add the parmesan and pepper, it shouldn't really need any salt but add if you think it does. Serve as quickly as you can! Hi, I made this last night, it was lovely, thanks! im gonna make this today :D thanks for recipe!